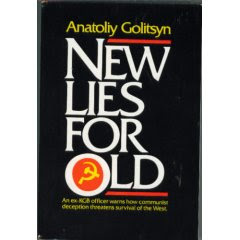 Anatoly Golitsyn is the author of two major books detailing his theories and analysis of Soviet/Russian/Chinese long range strategies. "The 'liberalization' [in the Soviet Union] would be spectacular and impressive. Formal pronouncements might be made about a reduction in the communist party's role; its monopoly would be apparently curtailed." "If [liberalization] should be extended to East Germany, demolition of the Berlin Wall might even be contemplated." "The European Parliament might become an all-European socialist parliament with representation from the Soviet Union and Eastern Europe. 'Europe from the Atlantic to the Urals' would turn out to be a neutral, socialist Europe." "The [Soviet] strategists are concealing the secret coordination that exists and will continue between Moscow and the 'nationalist' leaders of [the] 'independent' republics." 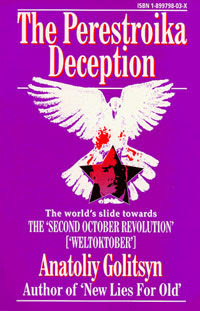 "The power of the KGB remains as great as ever... Talk of cosmetic changes in the KGB and its supervision is deliberately publicized to support the myth of 'democratization' of the Soviet political system." "Scratch these new, instant Soviet 'democrats,' 'anti-Communists,' and 'nationalists' who have sprouted out of nowhere, and underneath will be found secret Party members or KGB agents." I am curious if the author identifies weak points in the communist plan or offers a counter strategy? Golitsyn believed that the "former" communist countries would have to be "de-communised" as germany was de-Nazified" after WW2. Mostly however he advocated that the West should take a very hard line with Russia and China. It should be militarily ready to counter China and Russia and the West should most certainly cut trade with the "enemy". He also advocated a thorough cleanout of Western governments and security services, who Golitsyn believed were thoroughly penetrated by the KGB etc. Not much chance of that happening now with the USA being so over-stretched in the Middle East.